The Venerable' Bede (died 735), a monk of Wearmouth and Jarrow in Northumberland, is best known today as a writer and historian: perhaps his most important work is the History of the English Church, which extends from the arrival of Christianity in Britain, to his own day. This copy was probably made at, and certainly owned by, Rochester Cathedral. 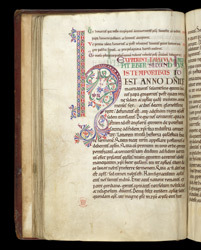 This brightly coloured initial 'H' introduces Book II. It is clear that the artist always intended to create a rather 'R'-shaped initial, because the scribe has left a space allowing for the contours of the appropriate shape.